Everything You Learned About Enzymes Was Wrong. First let’s talk about what an enzyme is: an enzyme is a large protein molecule that cleaves, cuts or eats specific pre-designated things (think of Pac Man with shark like teeth). Depending on the programming of the “teeth”, the enzymes fit over certain substances in a lock and key fashion, cutting through one specific type of thing, a particular type of protein let’s say yet leaving undisturbed protein of a similar but slightly different type. Enzymes are essential as “bio catalysts”, in other words they speed the action of chemical reactions. Without enzymes involved in every cellular event in out bodies the chemical reactions within us would be so slow as to make life as we know it impossible. There are some 3000+ enzymes in the human body, most of them of the proteolytic type. These 3000+ enzymes create between 7000 to 25000 different enzyme reactions. The 3000 enzymes themselves are created as a result of either our own enzyme production (which is finite in nature), or from ingesting enzymes from our live or uncooked food. 1) Enzymes are heat sensitive. Temperatures of 105 to 125 degrees F kill enzymes and their related activity. So cooked foods have virtually nothing in the way of enzymes. Enzymes cultured in laboratories can be made with an increased resistance to heat both in terms of degrees and in terms of time exposed to higher temps but overall the enzymes in food die from cooking. 2) Many scientists and physicians in the US still believe that enzymes are too big to pass through the intestinal tract and get into the blood stream intact. Something the size of Pac Man when compared to the dots he eats cannot possibly be absorbed through the tiny pores of the intestinal membrane. This ignores the medically known fact that Salmonella, a molecule 5 times larger than the largest enzyme, easily passes through the intestinal wall to be absorbed whole, (i.e. without being broken down and digested), into the blood stream. For those late bloomers here in the States – there are over 200 peer reviewed medical and university studies proving beyond the shadow of a doubt not only the absorption of enzymes but also their medical therapeutic actions. “Wait a minute”, you'll say, “that all sounds like digestion I though you said that digestion is the last thing an enzymes does”? Quite so lets look at what these enzymes are cleaving and where! Of the 3 enzymes listed, proteases and lipase's have systemic functions: that means they perform jobs all over the body in most every system. Only amylase, the carbohydrate lysing (cleaving or eating) enzyme acts almost solely in digestion. They are the first line of defense against inflammation. (1,2,3). Inflammation is a reaction by the immune system to an irritation. Let’s say you have an injured right knee. The immune system sensing the irritation the knee is undergoing creates a protein chain called a Circulating Immune Complex (CIC for short), tagged specifically for that right knee. (The Nobel Prize in biology was won in 1999 by a scientist who found the tagging mechanism). This CIC floats down to the right knee and causes pain, redness and swelling – the classic earmarks for inflammation. This at first is a beneficial reaction; it warns us that a part of ourselves is hurt and needs attention. But, inflammation is self-perpetuating, itself creating an irritation that the body makes CIC’s to in response! Aspirin, Ibuprofen, Celebrex, Vioxx and the rest of the Non Steroidal Anti Inflammatory Drugs all work by keeping the body from making all CIC’s. This ignores the fact that some CIC’s are vital to life, like those that maintain the lining of the intestine and those that keep the kidneys functioning! Not to mention the fact that they along with acetaminophen are highly toxic to the liver. Every year 20,000 Americans die from these over the counter drugs and another 100,000 will wind up in the hospital with liver damage, kidney damage or bleeding intestines from the side effects of these drugs. (4,5). Systemic enzymes on the other hand are perfectly safe and free of dangerous side effects. They have no LD-50, or toxic dose. (6). Best of all systemic enzymes can tell the difference between the good CIC’s and the bad ones because hydrolytic enzymes are lock and key mechanisms and their “teeth” will only fit over the bad CIC’s. So instead of preventing the creation of all CIC’s, systemic enzymes just “eat” the bad ones and in so doing lower inflammation everywhere and with that pain is lowered also. Enzymes eat scar tissue and fibrosis. (7). Fibrosis is scar tissue and most doctors learn in anatomy that it is fibrosis that eventually kills us all. Let me explain. As we age, which starts at 27, we have a diminishing of the bodies’ output of enzymes. This is because we make a finite amount of enzymes in a lifetime and we use up a good deal of them by the time we are 27. At that point the body knows that if it keeps up that rate of consumption we’ll run plum out of enzymes and be stone cold dead by the time we reach our 40’s. (Cystic Fibrosis patients who have virtually no enzyme production to speak of, even as children usually don’t make it past their 20’s before they die of the restriction and shrinkage in the lungs from the formation of fibrosis or scar tissue). So our body in its wisdom begins to dole out our enzymes with an eyedropper instead of with a tablespoon; result - the repair mechanism of the body goes off balance and has nothing to reduce the over abundance of fibrin it deposits in nearly every thing from simple cuts, to the inside of our internal organs and blood vessels. It is then when most women begin to develop things like fibrocystic breast disease, uterine fibroids, endometriosis, and we all grow arterial sclerotic (meaning scar tissue) plaque, and have fibrin begin to spider web its way inside of our internal organs reducing their size and function over time. This is why as we age our wounds heal with thicker, less pliable, weaker and very visible scars. If we replace the lost enzymes we can control and reduce the amount of scar tissue and fibrosis our bodies have. As physicians in the US are now discovering, even old scar tissue can be “eaten away” from surgical wounds, pulmonary fibrosis, and kidney fibrosis even keloid years after their formation. 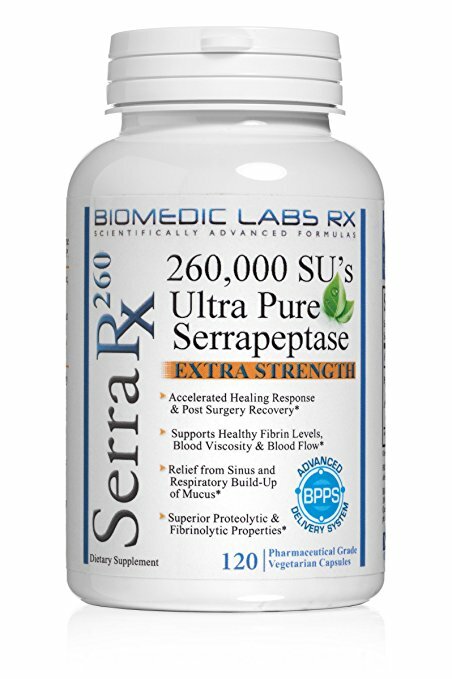 Medical doctors in Europe and Asia have known this and used orally administered enzymes for such for over 40 years! The blood is not only the river of life; it is also the river through which the cells and organs dispose of their garbage and dead material. Enzymes improve circulation by eating the excess fibrin that causes blood to sometimes get as thick as ketchup or yogurt creating the perfect environment for the formation of clots. All of this material is supposed to be cleaned off by the liver on “first pass” or the first time it goes through but given the sluggish and near toxic or toxic states of everyone’s liver these days that seldom happens. So the sludge remains in the blood waiting for the liver to have enough free working space and enough enzymes to clean the trash out of the blood. This can take days, in some folk’s weeks! (8). When systemic enzymes are taken they stand ready in the blood and take the strain off of the liver by; Cleaning excess fibrin from the blood and reducing the stickiness of blood cells. These two actions minimize the leading causes of stroke and heart attack causing blood clots. (8).Breaking dead material down small enough that it can immediately pass into the bowel. (8).Cleanse the FC receptors on the white blood cells improving their function and availability to fight off infection. (9). And here we come to the only warning we have to give concerning the use of systemic enzyme – don’t use the product if you are a hemophiliac or are on prescription blood thinners like Coumaden, heparin and Plavix. The enzymes cause the drugs to work better so there is the possibility of thinning the blood too much. Enzymes are adaptogenic seeking to restore a steady state to the body. (9). When the immune system is running low we become susceptible to infectious disease, when it’s cranked up too high then the system creates antibodies that attack it’s own tissues as are seen in the auto immune diseases of MS, Rheumatoid Arthritis, and Lupus. Here therapeutic dosing of oral administered systemic enzymes will tone down immune function and eat away at the antibodies the immune system is making to attack its bodies own tissue. Viruses harm us by replicating in our bodies. To do this a virus must bond itself to the DNA in our cells through the medium of its exterior protein cell wall. Anything that disrupts that cell wall inhibits the ability of that virus viral replication by rendering individual viruses inert. (10,11). Systemic enzymes can tell the difference between the proteins that are supposed to be in your body and those that are foreign or not supposed to be there, (again the enzyme lock and key mechanism). Even now the US Military has developed a proteolytic enzyme blend to be used as an anti biological warfare agent against Anthrax and viruses. (12). Lipase breaks down body fat so that it can start the long drawn out process of becoming blood sugar. Unfortunately as we age our own production of enzymes decreases and with that our ability to turn fat into energy decreases also. This could be one of the reasons why it is so difficult to lose weight after 35. Lipase supplementation could be used to cause the breakdown of body fat and help its conversion into energy, while decreasing body weight and cholesterol. (13). 6) Enzymes – A Drug of the Future, Prof. Heinrich Wrba MD and Otto Pecher MD. Published 1993 Eco Med.